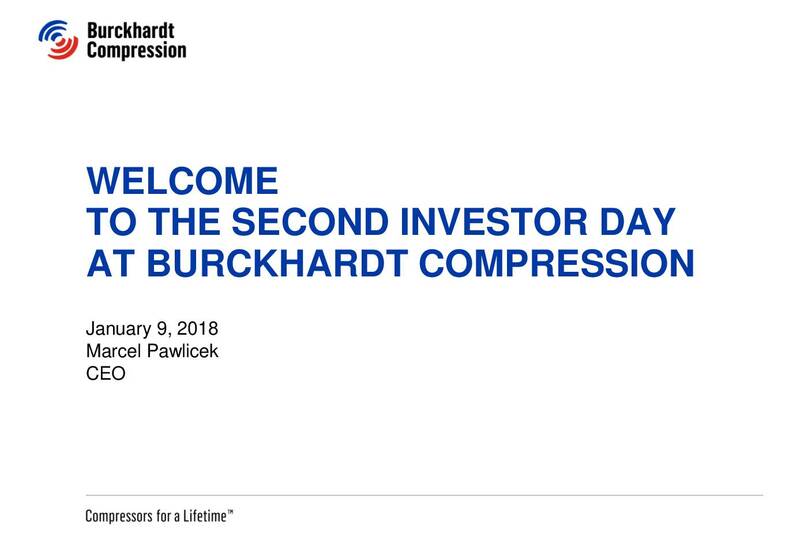 Burckhardt Compression, the world’s leading manufacturer of reciprocating compressors, will provide detailed information on its Mid-Range Plan at its Investor Day scheduled for today. The Mid-Range Plan was approved by the Board of Directors in early December. Group strategy is largely predicated upon organic growth, to which the full integration and consolidation of Arkos Field Services and Shenyang Yuanda Compressors will contribute. Burckhardt Compression is aiming for approximately CHF 700 million in sales by fiscal year 2022, split fairly evenly between the two divisions, with an EBIT margin of 10 – 15%. 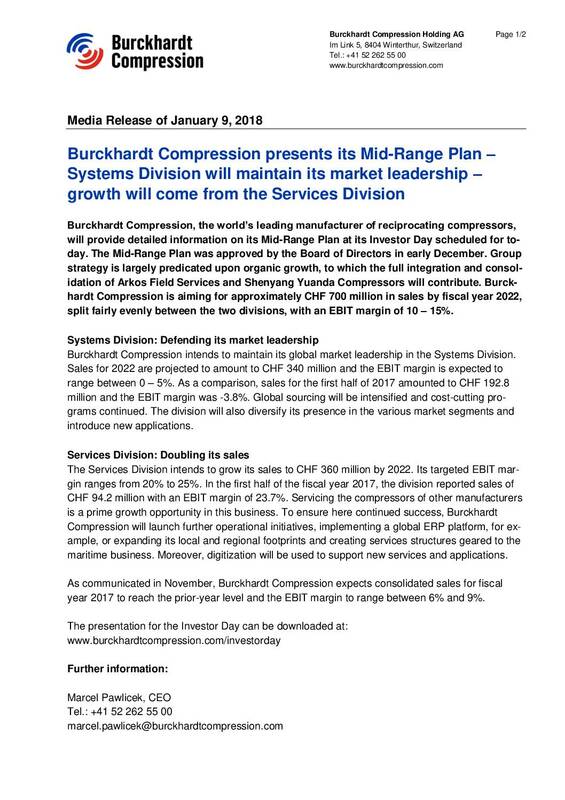 Burckhardt Compression intends to maintain its global market leadership in the Systems Division. Sales for 2022 are projected to amount to CHF 340 million and the EBIT margin is expected to range between 0 – 5%. As a comparison, sales for the first half of 2017 amounted to CHF 192.8 million and the EBIT margin was -3.8%. Global sourcing will be intensified and cost-cutting programs continued. The division will also diversify its presence in the various market segments and introduce new applications. The Services Division intends to grow its sales to CHF 360 million by 2022. Its targeted EBIT margin ranges from 20% to 25%. In the first half of the fiscal year 2017, the division reported sales of CHF 94.2 million with an EBIT margin of 23.7%. Servicing the compressors of other manufacturers is a prime growth opportunity in this business. To ensure here continued success, Burckhardt Compression will launch further operational initiatives, implementing a global ERP platform, for example, or expanding its local and regional footprints and creating services structures geared to the maritime business. Moreover, digitization will be used to support new services and applications. As communicated in November, Burckhardt Compression expects consolidated sales for fiscal year 2017 to reach the prior-year level and the EBIT margin to range between 6% and 9%.